Today – June 19th, 2015 – is Juneteenth, the oldest known celebration commemorating the end of slavery in the United States. Indeed, today is the 150th anniversary of the date that slaves in Texas heard that the Civil War had ended and that they were free. …it was on June 19th that the Union soldiers, led by Major General Gordon Granger, landed at Galveston, Texas with news that the war had ended and that the enslaved were now free. Note that this was two and a half years after President Lincoln’s Emancipation Proclamation (which) had little impact on the Texans due to the minimal number of Union troops to enforce the new Executive Order. However, with the surrender of General Lee in April of 1865 and the arrival of General Granger’s regiment, the forces were finally strong enough to influence and overcome the resistance. Later attempts to explain this two and a half year delay in the receipt of this important news have yielded several versions…Often told is the story of a messenger who was murdered on his way to Texas with the news of freedom. Another is that the news was deliberately withheld by the enslavers to maintain the labor force on the plantations. And still another is that federal troops actually waited for the slave owners to reap the benefits of one last cotton harvest before going to Texas to enforce the Emancipation Proclamation. I find this history of non-communication quite timely, given a rhetorical question I’d like to ask: did the South actually win the Civil War? I ask the question given several related issues that I’ve written about in recent blogs (numbers 129 – 131 and 133), as well as this week’s terrorist murders in Charleston. Of course, the South lost the actual war, slavery ended and the Union was saved. Of course, black people have theoretically equal rights and are better off economically. Of course, we’ve had a black president for over six years. 2 – Acceptance by the whole nation of the theory of white supremacy. One hundred and fifty years after the surrender, highly influential forces are reasserting the old conditions. As I have written, the myth of American Innocence is rapidly collapsing, and the search for scapegoats (as in 1865) has intensified. But of course those conditions didn’t go away in 1865. Southern states quickly enacted Black Codes to restrict the freedom of blacks and restore slavery in everything but name. The Ku Klux Klan and other terrorist organizations ensured that these conditions would last for most of another century. In 1876, the Reconstruction period ended with a compromise that removed federal troops from the last three occupied Southern states, enabling Democrats to gain complete political control of the South. In exchange Democrats permitted the Republican Rutherford B. Hayes, to become president. Soon, whites everywhere colluded in the “Lost Cause” myth (another Southern ideological artifact). This is a mythological issue, and it’s very significant. To an astounding degree, Northern and Southern whites came to agree that the nation had survived its greatest crisis and experienced a new birth that would express itself in further expansion. This new story – this new foundational myth – was based on the acceptance of the South’s number two objective. The vast majority of whites, North and South, agreed that blacks, though they had legal equality, were not sufficiently evolved to vote, to exercise political authority, or to have their children schooled along with white children. And this agreement in turn was based upon the fear of miscegenation, or race-mixing, another Southern belief. 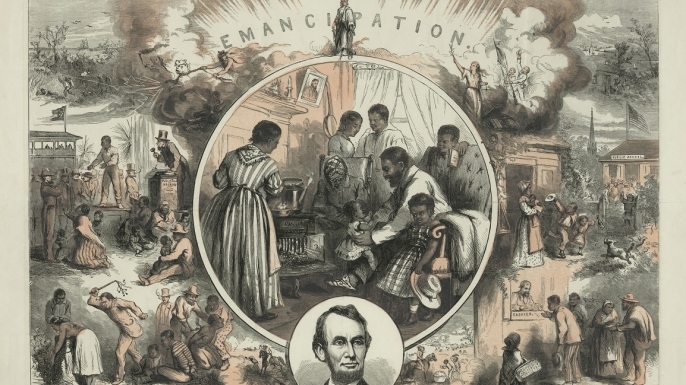 After emancipation, racism remained the foundation of a political economy predicated upon fear, the constant threat of violence, division of the working class and further refinements of whiteness and white privilege. The law long assumed that blacks were persons with any African ancestry. The “one-drop rule,” used by no other nation, made one a black person. “Octoroons,” who had seven white great-grandparents out of eight, were considered to be black. Northerners forgot the ex-slaves, consigning them to the reign of terror that would last for another century. In 1892, as the nation celebrated the 400th anniversary of the discovery of the New World, 240 black persons were lynched. By 1896 legal segregation was in place throughout the South. Thirty states enforced anti-miscegenation laws, sixteen of these laws lasting until 1967, over a hundred years after the “defeat” of the Confederacy. In 1913, Woodrow Wilson – the first Southerner elected president since the Civil War – declared that the war was “a quarrel forgotten” and then went ahead and segregated federal government offices. In the early 1920s the KKK literally ran several states. In the 1930s, as I have written in “Affirmative Action for Whites,” Franklin Roosevelt unified northern liberals and southern conservatives. But, like them, he maintained silence on race, fearing that the coalition would disintegrate. Southern politicians, who had defeated over 200 anti-lynching bills, supported Social Security only if it excluded agricultural laborers and domestic servants. This compromise deliberately kept most blacks outside of the welfare state. Social Security itself was unfair, because it used monies that blacks contributed to pay benefits disproportionately to affluent whites, who lived longer than most blacks. The Homeowner’s Loan Corporation gave out a million loans, none of them to black homeowners in white neighborhoods, and “redlined” countless black neighborhoods, preventing blacks from getting mortgages even in black areas. These policies continued for decades. As a result of these federal policies (which extended past World War Two with the racist G.I. Bill), an average black family still has one eleventh of the wealth of a white family, even when they make the same income. The South was victorious ideologically. Its view of the Civil War was the prevailing view in the North for a century. Columbia University Professor William A. Dunning, a founder of the American Historical Association and its president in 1913, was perhaps the most influential promoter of the Southern view. He portrayed Radical Republicans as villains…Dunning defended segregation by claiming that blacks were incapable of self-government. A star of the so-called “Dunning School” of post-Civil War historical writing was Ulrich Bonnell Phillips, who finished his teaching career at Yale. He defended slaveholders against charges that they were brutal, and he claimed they did much to civilize the slaves. Dunning School historians dominated American textbooks well into the 1950s and even the 1960s. In 2015, we can still trace the influence of these racist intellectuals in the thinking of many politicians and even academics. We can trace their influence further in the media pundits who consistently fan the flames of racial hatred in the minds of deranged “individuals” such as the mass murderer Dylann Roof and the white policemen who shoot unarmed black men every 28 hours. Sure there’s been progress; tell that to the aggrieved families. Everyone’s familiar with that famous quote from Martin Luther King: “The arc of the moral universe is long, but it bends towards justice.” Lately I’m wondering whether that isn’t just a sad and tragic expression of the myth of progress our culture religiously subscribes to. Your latest blog certainly conveys that sentiment, your last line even mentions progress ironically. I guess it’s blasphemous to suggest that progress is a toxic cultural myth, not a fundamental truth, but I have to put it on the table because now it looks like this myth has lost its potency, and become only a rallying cry for corporate sociopaths and politicians, and for the rest of us a pitiful way to put a happy face on the complex of trajectories now leading us to ecocide. I’m thinking that giving up the myth of progress can help us deal more realistically with what’s here and now, and quit waiting for the next miracle of technology or the next coming of the messiah to save us. Well said. I also have much to say about the myth of progress in my book.